J.B. Bernstein (Jon Hamm) runs a small agency representing professional athletes with his partner Aash (Aasif Mandvi). Being a smaller agency, they are not able to compete with the larger agencies. After losing his biggest potential client, the agency is on the brink of closing its doors. J.B. and Aash realize they need to find a new approach to get clients. J.B. comes up with a very unorthodox idea. India is an untapped market for sports talent. J.B. decides to hold a reality show type competition to find the best cricket players, who he can then bring to America to try out for a major league baseball team. Aash, along with Chang (Tzi Ma) reluctantly agree. J.B. has a year to find his contest winners and get them ready for a major league tryout. J.B. travels to India with Ray (Alan Arkin), a retired scout, to head up the competition. While there, J.B. meets Amit (Pitobash), a young man who desperately wants to be a baseball coach. Amit volunteers to help J.B. in his search. Since cricket bowling requires a different motion than baseball pitching, the contestants are nowhere near the level J.B. was hoping for. J.B., Amit, and the seemingly inattentive Ray travel from city to city, disappointed. Finally, they come across Dinesh (Madhur Mittal) and Rinku (Suraj Sharma), the only promising contestants. After being the only two that could potentially make it as MLB pitchers, J.B. takes Dinesh, Rinku, and Amit, all of whom had never left their small villages, let alone traveled outside India, to America. He hands Dinesh and Rinku over to Tom House (Bill Paxton) to coach them in the ways of American baseball. With the deadline for a tryout looming, J.B. is feeling pressure about whether Dinesh and Rinku will be ready for the test. 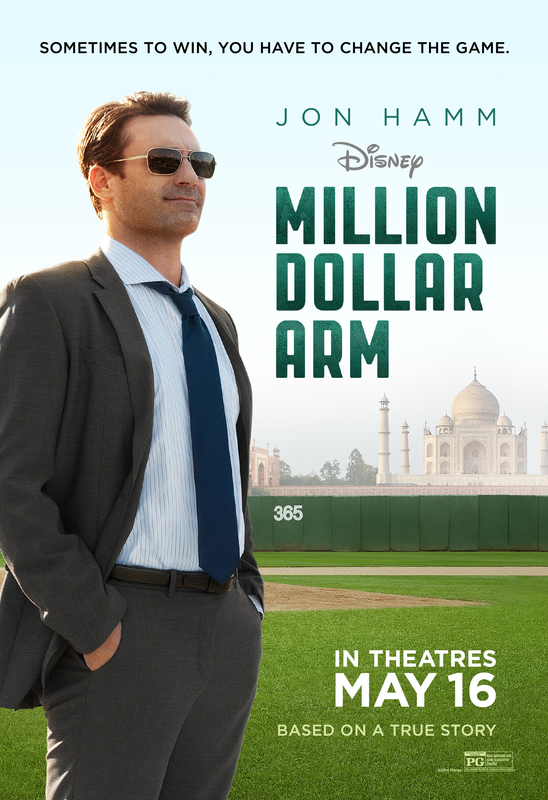 Million Dollar Arm is based on the true story of J.B., Dinesh, and Rinku. It is a tale of friendship, determination, and fighting for your dreams. Jon Hamm shows the right amount of desperation and selfishness to sell J.B. as an agent on the edge of failure. HE doesn’t want to give up his flashy, single lifestyle. And when he’s forced to, he reacts like everyone in that situation does. Lake Bell, as J.B.’s neighbor/tenant, serves well to bring J.B. back down to earth a bit. She’s cute and perky. Exactly the type of neighbor/tenant someone like Jon Hamm would have. And, while the interactions between the two may be a bit predictable, it fits the film. Alan Arkin, Pitobash, Madhur Mittal, and Suraj Sharma all fill in the comedy, to keep things light. Arkin, who could have played his character in his sleep, is mostly for sight gags, throwing in a few quips here and there. Pitobash, Mittal, and Sharma are your stereotypical fish out of water characters, playing young men from small villages who suddenly find themselves in the flashy, fast-paced American lifestyle. Luckily, that isn’t the extent of their characters. They all have a dream. They all have heart. They are charming. And that carries through the screen. So much so that they almost steal the film from Jon Hamm, making him the least likeable character. Sure, some of the jokes are obvious. And some of their scenes are a bit cheesy, but it makes for a nice family movie. Disney is going for a film with a Rudy type of feel, and brings us a feel good movie that makes for a good family night movie. My kids loved it. And I enjoyed it as well. Even if it’s a bit predictable, it is worth seeing.